The culture of Croatia has roots in a long history and so you find in the country cultural and historical monuments from all periods of the past. Croatian culture is for one part a reflection of the complex Western European culture. The Croatian coast is characterized by the influences of the Mediterranean culture, which is reflected in numerous historical monuments found along the coast. Continental Croatia is influenced by Central Europe from the late Middle Ages to the Baroque era, what can be seen in the many cultural monuments and the special architecture. The eastern coast of the Adriatic Sea was already since the early stone age densely populated. Archeological findings in caves around the islands of Hvar and Palagruž proof that there were even on the nowadays accessible islands already living people in that time. Thanks to the convenient geographical characteristics of our coast, that consists of numerous gulfs, bays and coves, the coastal area has always been a significant trade and nautical route. The Diocletian's Palace is a palace shaped like a trapeze and occupies the whole area of the core of the city of Split which is 28.900 m2.The Roman emperor Gaius Valerius Aurelius Diocletanus started in 295 a. C. with the building of the palace in the Brnistra Bay on the Dalmatian coast. After abdication in 305 a. C. the ruler retired, left Nikomedia and settled himself in the palace to spend there the rest of his life. After his death the palace stayed under the power of the tsar. In the 7th century when the inhabitants around Salona hid in the palace because of unset's from Avara and Slavens, they started to transform the palace. Today you still see the beauty of the Peristyle of the palace, the Diocletian's mausoleum, the temple of Jupiter, the columns and arcades along the road, the early Christian church, the Roman house and the port of Andrija Buvina as well as architectonic parts of Juraj Dalmatinac. This historical heart of present-day Split was inserted in 1979 in the register of World Cultural Heritages of UNESCO. Dubrovnik is a really beautiful historical town founded in the 7th century and situated in the south of Croatia. Its roots reach back till the Antique era. 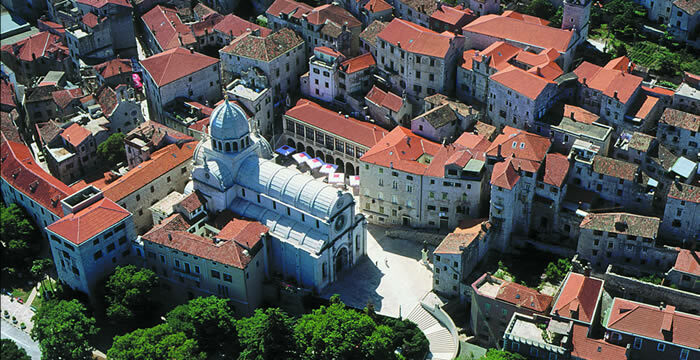 From the 14th till the 19th century it was the only marine city and a free Croatian State. Its biggest bloom was in the 15th and 16th century, therefore also referred to as the "Golden era of Dubrovnik". The preserved town core, surrounded by walls and fortifications, is the best known part of Dubrovnik. The main city wall is strengthened with three round and 14 quadratic towers, five towers of five angles, two fortifications and one big fort called Sv. Ivan. Of the towers the most monumental is the tower Minčeta, while the half-fort Bokar one of the oldest preserved fortifications of this type in Europe is. In Dubrovnik are also two independent fortresses, Revelin and Lovrijenac. The latter is situated on a sheer rock 46 m above the sea and serves as one of the most attractive open-air stages since the Dubrovnik Summer Festival were introduced. The Stradun is the most famous street in the middle of the center and connects the city gates Ploče on the east with the gates Pile on the west. The main altar is found in the baroque Cathedral which represents the polyptych Uzašašća Naše Gospe, by Tizian. The custom house, the Sponza Palace, the church of St. Vlah, the city-hall, the Rector’s Palace, the Jewish ghetto, that exists in Dubrovnik since 1352, with the synagogue of the 15th century which is one of the oldest preserved synagogues in Southeast Europe, all this are examples of the very rich and interesting culture and history of Dubrovnik. The Euphrasius’ Basilica is the Cathedral of the Ascencion of Maria, but is because of Bishop Euphrasius, who built it, better known as the Euphrasius’ Basilica. The cathedral, that was built in 553 a.C. is situated in the old town core in Poreč. The three-aisle Cathedral has two rows of tender marble pillars with luxurieus decorations. The interior and façade of the church are made with glorious mosaics and belong to the most beautiful protected parts of the Byzantine art. The Euphrasius’ Basilica complex consists further of the Atrium, the Baptistry, the bellfry, mosaics and sacred objects from the 3rd, 4th and 5th century as well as the surrounding Bishop court in which was not long ago situated the sacred collection of the diocese of Poreč - Pula. The complex has been listed by UNESCO in 1997 as a Worlds Heritage Site. The cathedral of St. Jakob is raised on the southern side of the city's main square in Šibenik, on the place of the Roman church St. Jakob. The construction started in 1431 and in the first decade were built the southern and northern wall, the lower, gothic part of the façade as well as both church portals. In 1441 Juraj Matvejev Dalmatinac, who studied arts in Venice, became the main constructor and went on to build the church in a late, floral Gothic style until his death in 1475. Nikola Firentinac went on to construct the cathedral in Renaissance style, completed the cupola and the façade and built the roof complex. The construction of the cathedrale went on untill 1536. The finishing works were done by the Venetian constructors Bartol and Jakov from Mestre and the Croat Mestričević, master of art from Zadar. This unique example of European sacred architecture was listed in 2001 as a World Heritage of UNESCO. The city Trogir, situated 20 km on the west of Split, is one of the oldest towns on the eastern Adriatic coast and was founded by Greek colonists from Vis in the 3rd century. Its historical center is situated on the small island occupied since prehistoric times and located in a channel between the coast and the island Čiovo, therefore also often called "Small Venice" or "City Museum". The core of the city is the best preserved Roman – gothic complex in Central Europe. The medieval core contains a preserved castle with tower and a whole serie of palaces from the Roman, Gothic, Renaissance and Baroque era. Without doubt the most famous building in Trogir is the church St. Lorenz, whose western portal was made by Radovan, and which is the most significant example of the Roman – Gothic style in Croatia. In 1997 UNESCO listed the city Trogir in the register of Worlds Culture Heritage. Poreč: Concerts of classical music in the Euphrasius' Basilica: every Friday throughout the summer season. Zagreb: International Garden Show "Floraart": first week in June, International Festival of New Theatre EUROKAZ): end of June, International Folklore Festival: July, Baroque Festival: Whole of July. Dubrovnik (Ragusa): City museum Dubrovnik Ducal Palace Museum, Ethnographic Museum, City Walls, Cathedral Treasury, Maritime Museum, Home of playwright Marin Držić. Split: Museum of Croatian archaeological monuments, Archaeological Museum of Split, Ivan Meštrović Gallery, City Museum, Ethnographic Museum, Museum of natural history, Art Gallery, Naval Museum, Zoological Gardens, Cathedral Treasury. Zagreb: Archaeological Museum, Ethnographic Museum, City of Zagreb Museum, Mimara Museum, Museum of Arts and Crafts, Museum of Contemporary Art, Natural History Museum, Strossmayer Gallery, Technical Museum, Klovićevi dvori Gallery.